This article was based on a set of internal administration documents given to The Maroon last month. More information on these documents can be found here. The University of Chicago planned to invite the presidents and provosts of every U.S. university and college to a conference on free expression in academic settings on October 13 and 14, according to an administrative document for the event. 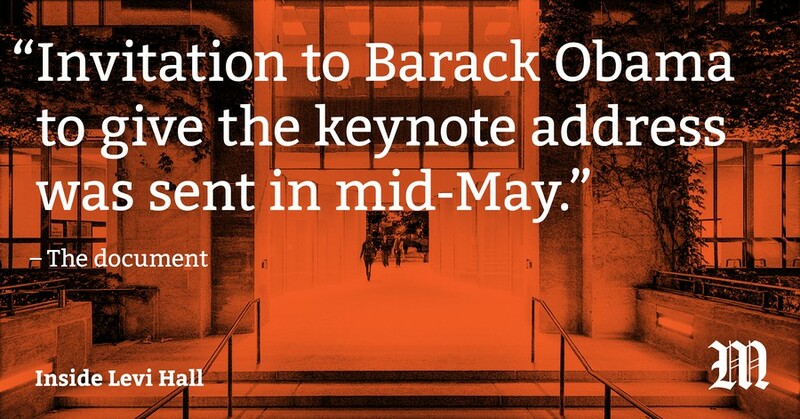 The University extended an invitation to former president Barack Obama in mid-May to be the keynote speaker for the event, according to a set of documents obtained by The Maroon. Former Obama adviser and founder of the University of Chicago Institute of Politics (IOP) David Axelrod would be “the next go-to” if Obama does not accept. The conference, as planned when the document was written, would be composed of a keynote address, which would take place on Friday evening, and three panel discussions on Saturday morning. The first panel, titled “Perspectives From Provosts/The Academy,” would reflect on “the key risks to the integrity of academe,” and the role of academic leadership in encouraging open, inclusive discourse on campus. Provost Daniel Diermeier, University of Chicago Law School professor Geoffrey Stone, and Kent State University provost and Senior Vice President for Academic Affairs Todd Diacon had all been confirmed for the panel. The second panel, “Administrative Perspectives on Student Life and Programming,” was slated to discuss appropriate administrative responses to “perceived controversy” and long-term methods to encourage students to be open to debate and dissent on campus. Proposed panelists included Michele Rasmussen, dean of students in the University, and leaders from a free speech orientation program at Purdue University, which guides students through hypothetical free speech quandaries and explains appropriate applications of the First Amendment. Finally, the “President’s Panel” would feature University of Chicago president Robert J. Zimmer, President Walter Kimbrough of Dillard University, President Laurie Patton (A.M. ’86, Ph.D. ’91) of Middlebury College, and President Ana Mari Cauce of the University of Washington. At the time the document was written, the president of Georgetown University, John DeGioia, had not yet been confirmed as a panelist. The inclusion of Patton is particularly noteworthy, given the protests which disrupted political scientist Charles Murray’s controversial appearance at Middlebury College in March. The incident reignited national debate on student protest and free speech on college campuses. Patton weighed in on the subject in an op-ed in The Wall Street Journal in June. According to the document, this group would discuss actions they have taken to make their universities more open to free expression while still maintaining safety, security, and inclusivity. Administrators at the University of Chicago have taken a leading role in the heated national conversation around freedom of speech, especially over the course of the last year. The University’s stance has been promoted as a model by advocates for free expression on campus. Zimmer was slated to introduce the keynote speaker and to possibly give an additional short speech before the panels begin.